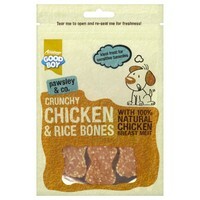 Good Boy Pawsley & Co Crunchy Chicken & Rice Bones are mouth-watering, healthy treats filled with goodness in novelty bone shapes. These delicious treats are made with 75% chicken with added rice and cereals and free from artificial flavourings and colours. They are oven baked, especially, to seal in the flavour, great as both rewards and training aids or just as a healthy treat for your loveable dog. The handy re-sealable bags keep your treats fresh.